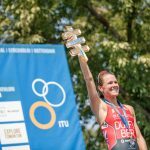 HUELVA – SPAIN – Glorious sunshine and pristine beaches packed with spectators welcomed participants to the first ever ITU Huelva World Cup, where two newcomers finished on top of the podium. Germany’s Justus Nieschlag claimed the men’s gold after a consistent and dominant race, with Czech Republic’s Vendula Frintova winning the women’s race by a comfortable margin over the rest of the field. 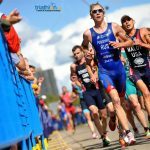 A calm, collected approach from Czech Republic’s Vendula Frintova at the first Huelva ITU World Cup paid huge dividends on Sunday morning as she won gold by an impressive 36-second margin over Canada’s Joanna Brown in a time of 2:01:14. The USA’s Chelsea Burns finished in third, narrowly beating Japan’s Yuko Takahashi to the line thanks to a blistering final flourish. It was a beautiful morning on Huelva beach as the athletes lined up on the sands for two laps of the swimming course, the calm water offering excellent conditions for the start of the race. 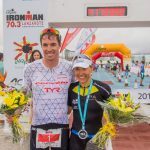 It was Yuko Takahashi who again played to her strengths in the water, establishing a halfway lead that she then extended, delivering the only sub 19-minute swim to emerge in front of a ten-strong pack of cyclists that included Spain’s Sara Perez and Italian Ilaria Zane alongside Burns and Brown. The coastal scenery changed dramatically as the city drew into view, Frintova adapting brilliantly to attack the tight turns and thrive through the technical section, with Mexico’s Cecilia Perez with USA’s Lindsey Jerdonek also staying in touch with the leaders through the climbs and cobbles that followed the highway’s more straightforward challenges. As the Czech extended her lead to over 20 seconds, Burns and Brown both struggled with the second transition, and Frintova was ruthless with the opportunity that was presented her. Indeed, it was only the USA’s Chelsea Sodaro who managed to outpace Frintova in the run, Joanna Brown comfortably going through the gears to make her way back into second but the gap to the leader never looked under threat. As Takahashi tired, Chelsea Burns sensed an opportunity to take advantage, securing a podium finish thanks to a stirring final lap under the Spanish sun, 50 seconds behind the winner. Fellow American Renee Tomlin and Italy’s Annamaria Mazzetti finished fifth and sixth. But there can be no doubt that the morning belonged to Czech Republic’s Vendula Frintova. Having worked her way into contention from the chasing pack of cyclists, her technique was flawless in the final stages of the bike, and the impressive composure she was able to maintain having taken the lead made her an impossible target to catch through the streets of Huelva. 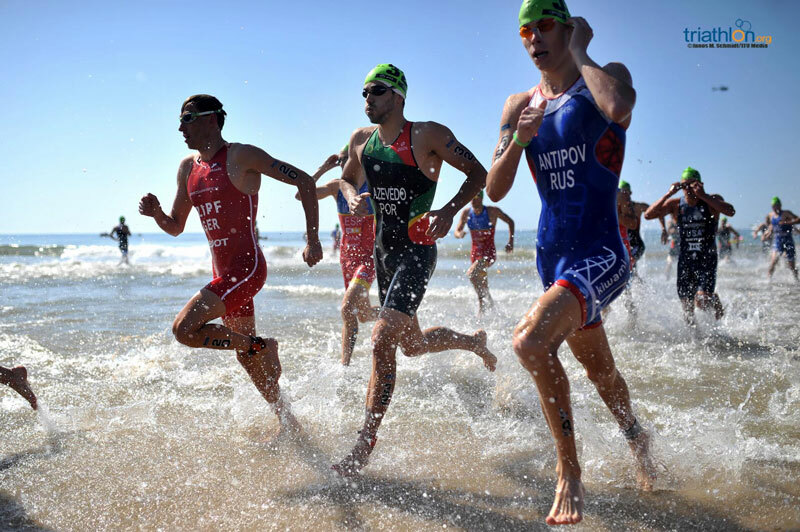 Thousands of spectators lined the Punta Umbria beach at noon for the start of the Elite Men’s race, ready to enjoy the spectacle of 60 athletes dolphin-diving into the Atlantic Ocean waters, Norways’ Jorgen Gundersen leading the pack from the first strokes. Close behind, Justus Nieschlag (GER) and Alberto Gonzalez Garcia (ESP) managed to open up a small gap going into the second lap of the 1500m swim. With a bike section of 20km before arriving into the city for four laps of the city centre, all the athletes knew that positioning themselves in the leading group would be crucial, and the majority of the favourites succeeded in that mission. Matthew Sharpe (CAN), Gordon Benson (GBR) and Kevin McDowell (USA) led along with Nieschlag, Gonzalez and Gundersen in the first group of bikes, and by giving relays they managed to build up a strong advantage over the chasing pack. In that pack, almost one minute behind after the first 20km, was one of the pre-race favourites, Vicente Hernandez, wearing number 1 but not lucky today in the swim. 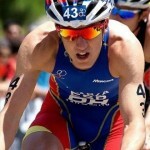 The Spaniard led the chasers up the Cuesta de las Tres Caidas hill four times as he tried valiantly to connect with the leaders. The technical and hilly course, featuring some tricky cobbled turns, proved to be perfect for the lead group of 11 – not too big for the sharp turns, and not too small to prevent the energy-saving relays. At the end of the 40km bike course, they had carved out a 47-second lead with Vicente Hernandez still heading up the big chasing group. As it came down to the run, and with the sun streaking hard on all the triathletes, it was Nieschlag who took the lead coming out of T2, a position he refused to give up all the way to the line. For the first lap he had Benson right on his heels, but the heat started to sap the Brit’s energy, losing one position per circuit to finish in what will be for him a disappointing fourth place. Crossing the finish line in second place was the American McDowell, grabbing a first World Cup podium place of his career, while Spaniard Uxio Abuin put in an impressive final flourish to finish third, pushed on all the way by the cheers of the home fans.